The Masters is perhaps the most iconic golf tournament of them all; it is played at, the most fabled and challenging course of them all, Augusta; and the prize for the winner is not a glittering trophy but the fabled green jacket. For golf fans, a trip to the Masters is the pilgrimage they all want to make once in their life. But most have to content themselves with watching on TV at home. Even this has become harder though as The Masters has followed so many major sporting events and sold its rights to various expensive cable and satellite channels. But that is not the case everywhere. It is still possible to watch the Masters for free in some countries. And thanks to a VPN, that means it is possible for anyone anywhere to tune in. In this article, we will tell you exactly how to use a VPN to watch the Masters for free, no matter where in the world you are. So if you want a free pass to the greatest golfing tournament of them all, just keep on reading! To watch for free, the first thing you have to do is find out which countries are showing the Masters on a free-to-air channel. We have done the research for you and the answer is… Australia! In Australia, all four rounds of The Masters are being broadcast live and exclusive on the Nine Network, a free to air network which includes Channel 9 and 9HD. Most importantly for international viewers, it is also being streamed live on their 9Now streaming platform. If you try and access 9Now from overseas, you will get an error message saying the service isn’t available outside Australia. But getting around this small problem is remarkably easy. All you need is a VPN app and some kind of internet-connected device like a smartphone, tablet, or laptop to watch on. What is a VPN and how do I get one? If you ‘Google’ VPN, you will find lots of talk about online security and privacy protection and yes a VPN does do that. But they are also a great little tool for unblocking content that is geo-restricted for internet users in certain locations. What this means is you can use a VPN to trick streaming services like 9Now into thinking you are in the right country to watch, even if you aren’t. The other thing a Google search will throw up is hundreds of different VPN providers. Choosing the best one can be hard, but that’s where we come in. Our job is to test and identify the best VPNs for different situations. And the best VPN to stream The Masters 2019 on 9Now is ExpressVPN because it’s the fastest and most reliable provider. Once you have chosen your VPN, the next job is to set things up. It’s really simple and to help walk you through it, we have created a short 4-step guide for you to follow. The first thing you have to do is sign up for a VPN. This is the only cost involved, it is a small one, and most VPNs, including ExpressVPN, offer a money-back guarantee you could make use of. To sign up, simply click on one of the links on this page and then follow the simple onscreen instructions. Once you have signed up, you will need to download the VPN app. This can be done on their website. For ExpressVPN, just visit the Products tab on their homepage. 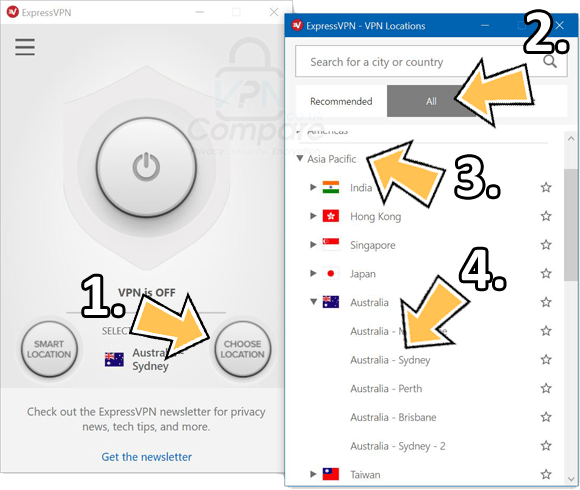 If you are downloading the app onto your smartphone or tablet, the easiest thing to do is search for ExpressVPN in your usual app store. To watch The Masters on 9Now, you will need to connect your VPN to an Australian server. This is really easy to do. Just click on ‘Choose Location‘ (1) (or the ‘…’ on a mobile). Then select ‘All‘ (2) followed by ‘Asia Pacific‘ (3) and then finally ‘Australia – Sydney‘ (4). If you’re using a computer you’ll need to press large ‘Connect’ button. If you’re using a phone or tablet, it will connect automatically for you. Watch The Masters using ExpressVPN. That’s pretty much it. All that’s left is to open up 9Now, choose The Masters live stream, sit back, and enjoy. You’ll most likely be glued to your sofa for four days at least. The Masters 2019 promises to be a thrilling spectacle once more. When is The Masters 2019 on? 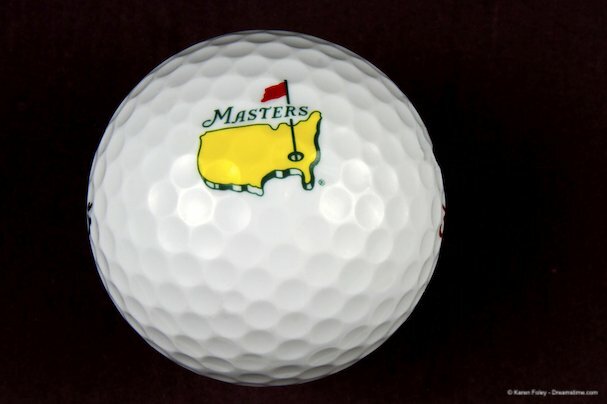 The first round of The Masters 2019 will tee off at 13.15 (BST) on Thursday 11th April. Golfing legends Jack Nicklaus and Gary Player will be the honorary starters before the real competition begins in earnest. Some first round tee times to look out for include defending champion Patrick Reed (15.41 BST), Tiger Woods (16.04 BST), and Rory McIlroy (16.15 BST). At 18.49 BST, the strong trio of Justin Rose, Phil Mickelson, and Justin Thomas are the penultimate starters before the final group of the day at 19.00 BST, which includes Jordan Speith, Paul Casey, and Brooks Koepka. The second round on Friday 12th April will begin at the same time before the final two rounds on Saturday and Sunday 13th and 14th April begin at around 18.30BST. The big names always go into the Masters as favourites despite the fact it is renowned for its unpredictability. This year Rory McIlroy is favourite with the British bookies with Dustin Johnson, Justin Rose, and Jon Rahm hot on his heels. Tiger Woods has been rejuvenated of late and is a popular choice with punters as is the wunderkind of US golf, Jordan Speith. The Masters is always an amazing spectacle and this year promises to be no different. If you don’t want to miss a moment of the action and don’t want to pay through the nose either, this article has everything you need to know. Just sign up for a VPN such as ExpressVPN, connect to an Australian server, and you can watch all four days of the action live on 9Now. It couldn’t be easier and the rewards for golf fans promise to be really special!